Which 2017 Luxury Minivan shocks with limo like opulency? The Best 2017 Luxury Minivan is the Toyota Sienna, with its Lexus-like amenities and premium feel. No luxury automotive brand offers a minivan. But if Toyota’s upscale Lexus division did, it’d likely be a lot like the Sienna’s flagship Limited Premium trim. With indulgent, La-Z-Boy-type reclining seats, widescreen DVD entertainment, and available all-wheel drive, a Sienna Limited Premium won’t leave you wanting for high-end comfort, convenience, and safety features. It’s our top choice for minivan opulence, but it’s got compelling company in the 2017 Chrysler Pacifica Limited and Kia Sedona SXL. 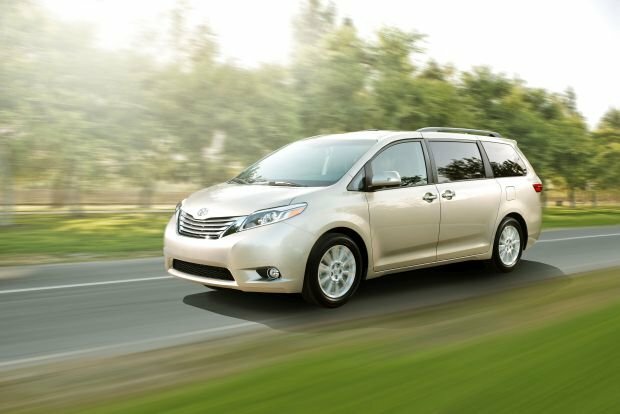 The Limited Premium shares its 266-horsepower V-6 engine and six-speed automatic transmission with the rest of the Sienna line. Front-wheel drive is standard; all-wheel drive (AWD) – a feature exclusive to the Sienna among consumer-class minivans — is a $1,140 option. Here, AWD improves wet- and dry-road handling, but diminishes ride comfort slightly and exacts an arguably significant convenience feature we’ll discuss below. The Sienna Limited Premium looks at first blush as if it runs with the pack of other line-topping minivans, which includes the Pacifica Limited and Sedona SXL, as well as the Honda Odyssey Touring Elite. Items such as leather upholstery, heated front seats, keyless ignition, and in-dash navigation are standard. Dig a little deeper into the Limited Premium’s feature set, though, and you’ll find a very compelling and upscale package. The Limited Premium ups the luxury ante with standard rain-sensing windshield wipers, high-intensity-discharge (HID) Headlights that provide better visibility, and front- and rear- obstacle detection. The standard rear entertainment system uses an ultra-wide 16.4-inch screen with built-in Blu-ray movie player and separate HDMI input. The display can show two sources simultaneously, so you can have two movies going on at once, or a movie and a video game. Also included is Toyota’s “Driver Easy Speak,” which uses a built-in microphone and the vehicle’s speakers to allow front-seat occupants to more easily communicate with those seated in the third row. Speaking of the third row, it power folds into the cargo floor, provided your vehicle is front-wheel drive. The AWD system takes up the space needed for the power-folding motor, so you’ll want to take this into consideration before you make your purchase. Sienna is available with seating for eight, but the Limited Premium accommodates seven, and how it does it puts this Toyota on top as the Best 2017 Luxury Minivan. Its second-row captain’s chairs slide fore and aft up to 23 inches to benefit legroom, but they also recline and include a built-in leg rest. All this adds up to seats that provide geniune first-class comfort. Similar reclining second-row captain’s chairs are standard on Kia’s Sedona SXL, along with high-quality Nappa-brand leather upholstery. A cooled glovebox, programmable power rear liftgate, and other available amenities such as radar-based adaptive cruise control and a surround-view camera further elevate this minivan as a top luxury choice. Sedona’s rear entertainment system doesn’t match Sienna’s widescreen, multi-source unit, however. Also, selecting some extra-cost items, such as heated second-row seats, means you have to give up the Nappa seating surfaces. Still, it has enough high-end features to satisfy many shoppers. When you combine them with Kia’s top-flight warranty coverage, and the 2017 Sedona SXL is a luxury minivan that upwardly mobile family should seriously consider. Rounding out our list of best 2017 luxury minivans is the Chrysler Pacifica Limited. This redesigned replacement for the aged Chrysler Town & Country and Dodge Grand Caravan is fully up to date and packed with amenities. While Pacifica doesn’t offer its rivals’ La-Z-Boy seating, its rear entertainment system has Blu-ray support, auxiliary HDMI input, and built-in games. It all comes together in a vehicle whose on-road character is as sophisticated as it looks.